Palmer Candy is a maker of delicious candy based in Sioux City, Iowa. Since its establishment in 1878, it has been a trusted name in the confectionery industry. The history of Palmer Candy Company starts in 1878, when the Michigan house of Edward Cook Palmer was destroyed in a fire. He and his family moved to Sioux City, Iowa, after the fire and bought a grocery company. In 1892, a wholesale fruit company was opened by William B. Palmer, Edward Palmer’s oldest son. William’s father and brother also became partners of his business, and the company was named Palmer and Company. Later, they also started making candies on a small scale. Due to its success, the company was moved to larger premises in 1900. In 1923, it introduced the famous Bing candy bar. In 1941, the company acquired Soo Candy Company. Since then, they started manufacturing peanut candies. Palmer Candy also acquired the La Fama candy brand of Johnson Biscuit Company. The fruit business of Palmer was closed in 1969. In 1973 they added the Twin Bing to its product line when “The Bobbsey Twins and the Secret Candy Castle” was published. The popular “Side by Side” song of Bing Crosby also inspired its name. In 1979, the manufacturing plant was moved again to larger premises. It became very successful with its product line of unique candies. Palmer Candy was also involved in peanut roasting, warehousing, and re-bagging. It opened a retail store in Sioux City named Old Time Candy Shoppe. In 1986, when Elvis Presley was inducted into the Rock and Roll hall of fame, the Palmer Candy Company introduced the King Bing candy bars. 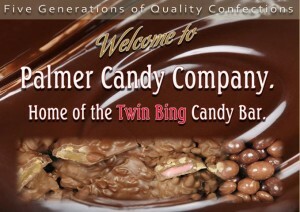 The Palmer Candy Company celebrated 125 years in business in 2003. It also purchased a distribution center the same year, with 220,000 sq. ft. of space. In 2008, the historic building at 405 Wesley Street was refurbished, and the Old Time Candy Shoppe was relocated to the building. Palmer Candy also opened a museum in the same building to highlight the 130 years of business of the company. a link to the proper logo please?